The SteadyServ keg sensor collects and sends a host of information including how much remains, the type and style of the beer in the keg, when it was delivered, when it was tapped, its age, and when the keg may “blow” up. Approximately 162.5 million beer drinkers each year show up to a retail establishment and are told that their favorite beer is out. Consumers drink one third less beer when their beer of choice is out. 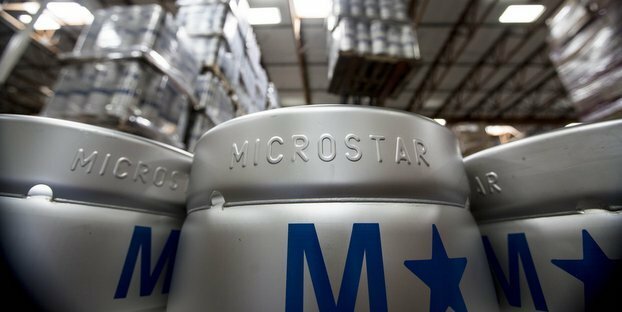 Distributors pour millions of dollars in beer down the drain due to freshness issues each year, and they are required by law to buy back millions of old beer each year too. Beer reps spend an average of two to four hours per week on ordering and inventory, and 20 percent of these orders are wrong. All these facts come via SteadyServ, a company that produces a mobile, SaaS-based inventory and order management system for the beer industry. Might you need their services? SteadyServ is a mobile app that gives you real-time information on your beer. You’ll know exactly how much you have, when it will run out and how much you need. Plus you’ll learn how quick you are going through all of your beers, which are most popular or profitable and which ones aren’t. The SteadyServ keg sensor collects and sends a host of information including how much remains, the type and style of the beer in the keg, when it was delivered, when it was tapped, its age and when the keg may “blow” up. It sends this to SteadyServ’s cloud based software where it is paired with other information such as how much safety stock remains, the next delivery date, previous order information, past consumption trends, event information, beer consumption trends nearby and even local weather which may impact patronage trends. How many hours per week do you spend on ordering? If your answer was more than 5 minutes, then SteadyServ can help. Have you ever experienced a wrong order? This is a common problem and we bet that no matter whether you work for a distributor or a retailer you’ve experienced at least one major order and inventory mistake in the last week. What if the vast majority of those mistakes went away? What would that be worth to your organization in time and dollars? If you are unsure how these changes can impact your business, try SteadyServ’s ROI Calculator. Every week bar managers and staff spend hours ordering beer the old fashioned way: with pen and paper. SteadyServ allows you to order from your distributor via an easy to use iPhone, iPad, and Android mobile app. This process lessens the time it takes to order and ensures that your order is 100 percent accurate. iKeg uses state of the art M2M (machine to machine) communication technologies to ensure the highest level of inventory and order management accuracy. How does it work? Well SteadyServ’s iKeg system is simple to set up, simple to understand and simple to use. Outside of logging in and using the smart phone app, the retailer never has to do anything except manage their settings and oversee the inventory ordering process which is collapsed from hours to literally minutes. The iKeg app also allows the retailer to set up customizable automatic social alerts to Facebook and Twitter every time a new beer goes on tap. It also provides a number of fully integrated manual tools to promote the establishment, event or even a beer you want to highlight. For the distributor, it requires light ERP integration using published APIs. SteadyServ’s SaaS (Software as a Service) can integrate with a distributor’s enterprise ERP system, IMS or WMS systems or it can stand alone as a separate system. Information is delivered in real-time to the handset. Reports can be generated on demand or against stated schedules. The iKeg system is secure, reliable and highly scalable. Designed to be “Apple-easy,” setup and systems management is simple. The iKeg system uses its own secure wireless backbone that incorporates the highest level of security, ensuring that the distributor and retailer’s order and information systems can’t be compromised. iKeg uses state of the art M2M (machine to machine) communication technologies to ensure the highest level of inventory and order management accuracy. For more information, visit SteadyServ’s site right over here. @CraftBrewingBiz thx again for such a great article.Excited to be of service to the #beer industry! Wanting & Having Ur Beer R Not The Same! Jason Rister liked this on Facebook.